Click any of the links below to view some of our recent Roofing Project photos. These Photos Are Of A Roofing Project Recently Completed By Chittenden Builders. This is a 100 Year Old Family Owned Camp Located In Mallets Bay Colchester Vermont. These Photos Are Of A Multi-Level Home Roofing Project Completed By Chittenden Builders Roofing Contractors Vermont. This Home Is Located In Essex Vermont. An Owens Corning Shingle Roof Replacement in Georgia Vt. including the removal of existing roofing materials. The installation of new drip edge, ice and water protection, underlayment, and limited lifetime Owens Corning Duration Architectural Shingles. The skylights were wrapped with ice and water protection to assist in providing superior water protection. Metal valleys were installed to provide an improved ability for the roof to shed water and debris in the valleys and also enhance the appearance of the new roof. 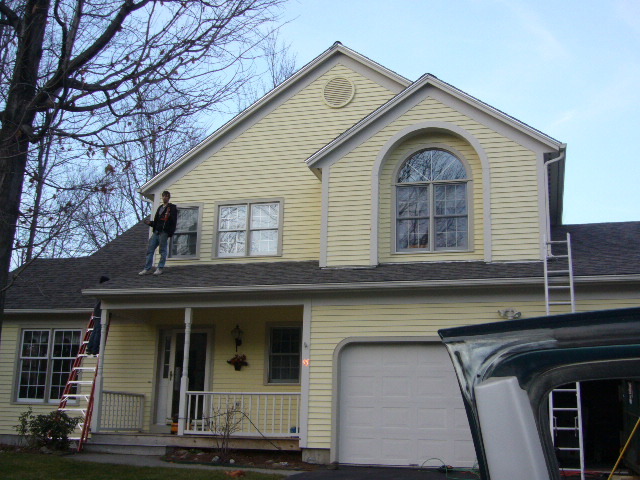 This Roofing Project By Chittenden Builders Roofing Contractors Vermont Was Recently Completed After The HomeOwners Watched The Roof Across The Street Being Completed And Complimented Us On The Excellent Work We Performed. One Of The Greatest Compliments A Company Can Receive Is When They are Asked To Complete A Project Based On The Results Of Previous Services Performed. These Photos Are Of A Multi-Level Home located in Shelburne Vermont. This Roofing Project Was Recently Completed By Chittenden Builders Roofing Contractors Vermont. These Photos Are Of A Multi-Level Home located in Shelburne Vermont. These Photos Are Of A Corrugated Metal Roofing Project recently Completed By Chittenden Builders. This garage is located in Williston Vermont.